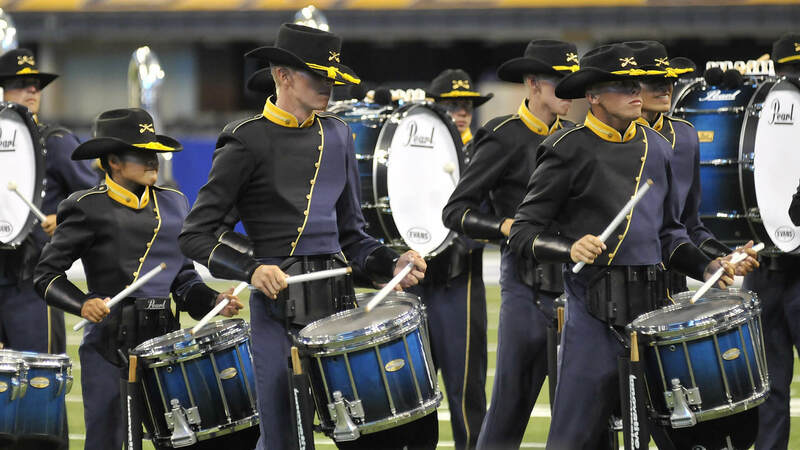 At the 2010 Drum Corps International World Championship Semifinals, the Colts finished in 13th place for the fourth time in six years, with the Academy sixth tenths of a point behind. Troopers, after making the Finals in 2009 for the first time since 1986, had to settle for 15th place. Troopers finished in that 15th spot in both Quarterfinals and Semifinals, despite slipping 0.85 points from one day to the next, the most of any Semifinalist. While no caption placed higher than 14th, no caption placed lower than 16th. 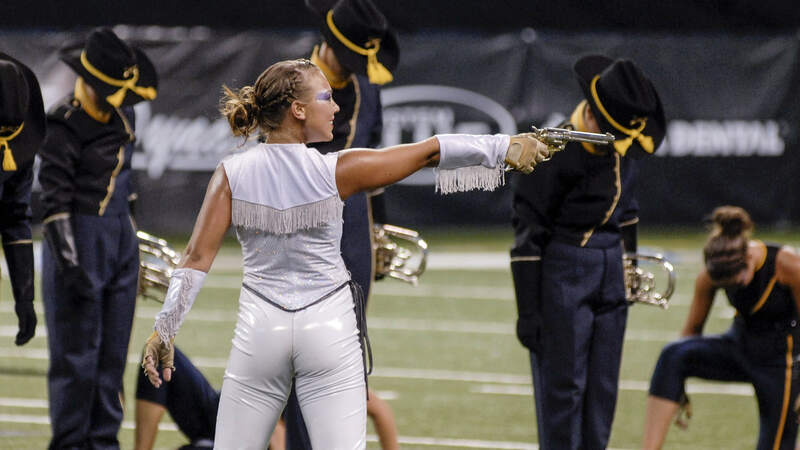 Corps members hit the field this season with new uniforms based on that of the drum major, de-emphasizing the yellow highlights and emphasizing the vast expanses of black and dark blue, intentionally drawing one’s eyes more toward the color guard. Throughout “Wanted,” the good guys of the old West were pitted against less savory characters, with the color guard gradually transitioning from the good characters (dressed in white) to those with bad intentions (dressed in black). Playing off the same out-of-character musical cues that witnessed pieces from “West Side Story” in the corps’ 2009 show, Václav Nelhýbel’s “Trittico, Mvt. 1” is certainly not going to come up when one thinks of music of the old American West. Nelhýbel was born in Prague in 1909 and came to the US in 1957, eventually serving much of his remaining four decades as composer-in-residence at the University of Scranton. The brutally aggressive three-movement “Trittico,” written in 1963, was composed for the famed William D. Revilli and his University of Michigan band. The sinister quality of the first movement, which would have made great a great musical score for a train robbery movie, captured the evil intentions of the outlaws (played by the horns and drums) as they descended upon the innocent citizens (the color guard) of the Western plains. A lone guard member was attired in black, starting the transition of the good folk to evil. Aaron Copland wrote “Our Town” for the 1940 film based on the play of the same name by Thornton Wilder. The play and film portrayed the daily lives of regular citizens, and Copland’s music perfectly captured the innocence of their existence. Prior to the 1940s, Copland was largely familiar only to the new music community, which wasn’t very lucrative for him. But in 1939, his score to his first feature film, “Of Mice and Men,” received an Academy Award nomination, his ballet “Billy the Kid” was staged, and his landmark book, “What to Listen for in Music,” was published. The “Our Town” music, though set in the fictional town of Grover’s Corners, New Hampshire, captured the sense of the wide-open expanses of the old West and was the perfect vehicle for contemplation amidst the shimmering purple and blue of the Troopers’ flags. Next up was Michael Gordon’s darkly ominous “Borinage,” written in the late 1980s and finally seeing light in his 1991 video theater work, “Van Gogh Video Opera.” The composer, born in Florida in 1956, grew up in the jungles of Nicaragua. During a drum break, the piece transitioned into Radiohead guitarist Jonny Greenwood’s ominous “Proven Lands” from the 2007 feature film, “There Will be Blood.” The Paul Thomas Anderson film was inspired by Upton Sinclair’s novel, “Oil!,” which told the story of a ruthless oilman striving for great riches during Southern California’s six-decade oil boom that was fairly evenly split between the 19th and 20th centuries. Peter Graham’s brass band work, “Journey to the Centre of the Earth,” was written in 2005 for the 100th anniversary of the death of science-fiction author Jules Verne. The music follows the exploits of intrepid explorers who follow coded diary entries to the crater of an extinct Icelandic volcano, which further leads them into the depths of the Earth. Members of the guard stripped off their white costumes to reveal the final transformation to the dark side, now wearing “bad-guys-wear-black” costumes. The production concluded with a brief ending of “Night Flight” from Kenji Bunch’s “Swing Shift,” a six-movement work originally describing in music the spirit of New York City after dark. During this segment the drum major fell in love with the one remaining member of the color guard still dressed in white. But looks can be deceiving, as she pulled a gun on him, forcing him to raise his arms in surrender. As the horns marched past to leave the field, his arms were still raised, reminding us to not judge a book by its cover. For this week only, you can save on the DVD that contains this complete Troopers performance, along with all corps from Volume II of the 2010 DCI World Championship DVD set. Buy the 2010 Volume II DCI World Championship DVD. DVD discount offer ends Monday, Sept. 21, 2015.